Two well behaved pets welcome (not suitable for large breeds). 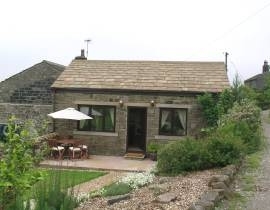 The cottage is situated on a circular footpath walk spanning 4.5 miles which leads to Top Withens, believed to be the setting for Emily Bronte's Wuthering Heights. Haworth village is situated approximately 2 miles away and is home to the Bronte Parsonage and Museum and the Worth Valley Stream Railway Line, as seen in the original version of The Railway Children. An excellent selection of gift shops, tea rooms and restaurants can be enjoyed in the village which attracts visitors all year round. Ground Floor Hollies Cottage is a ground floor detached cottage heated by LPG heating and briefly comprises: Lounge/Kitchen/Diner: With TV, DVD and sofa bed, electric oven and hob, microwave, fridge with icebox, and washer/dryer. Bathroom: With power shower with body jets, WC, basin and shaver point. Bedroom: With double bed and combi tv/video All fuel, power, bed linen and towels included. Private paved patio with garden furniture and garden, one large pond (Young children must be supervised) and BBQ. Sofa bed is only suitable for a child as the shower room is accessed by the bedroom. Two well behaved pets welcome (not suitable for large breeds). Property accessed via a farmtrack, unsuitable for low vehicles. Welcome pack provided. Nearby Restaurant Distance: 1 mile, Pub Distance: 1 mile, Shops Distance: 2 miles, Nearest Town Distance: 2 miles, Nearest Town: Howarth, Railway Station Distance: 2 miles, Railway Station: Howarth. Prices range from £280 to £380 depending upon dates and availability - check for late offers.